The local angle isn't always necessary to be successful, says AEG's Goldstein. Take the Staples Center in Los Angeles, which he also considers one of his company's most successful deals. 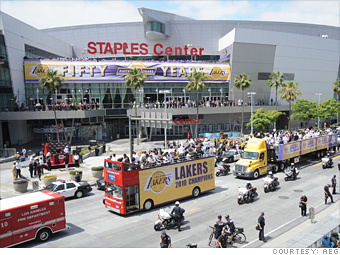 It helps that the Staples Center is home to the Lakers, which has been among the best teams in the league since the center first opened in 2009. Even though Staples' headquarters is far away in Massachusetts, the company has been a "true partner" in all aspects of building the center, Goldstein says. Getting in early on a beloved team helps, says Neely, as does the fact that Staples isn't a polarizing brand -- most consumers come into the center with no preconceived notions about it, so it borrows some prestige from the tenants. The arena is also home to the Los Angeles Clippers, whose record hasn't been quite as sterling, but no one is going to blame an office supply company for a basketball team's fourth quarter failures.